Her shirt reminds me of Strawberry Shortcake. Thanks to some friends for offering to watch Bria, David got an early birthday present and we snuck off to an Indians game. They played the Texas Rangers in nearby Arlington. We scored some really close, cheap seats! It's just too bad that, out of the 3 game series, the game we attended was the one when the Indians got smashed. But it was a really fun, nice night. And I got my kettle corn. Here's Grady Sizemore. Too bad his parents named him "Grady." Shoulda started his name with a B and it'd be much cooler. A Pronk bar, named after Travis Hafner the famous Indians player. We picked one up at the local chocolateria Malley's (too bad they're not in Texas). 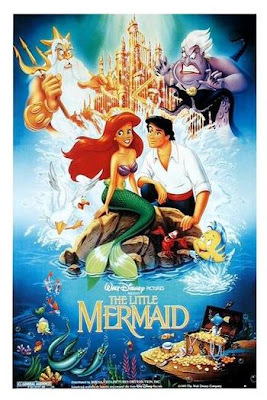 Bria's obsessed with The Little Mermaid movie. She asks for it all day every day. And as much as I love Disney movies, I have a few issues with Ariel. That said, the movie has great music, a unique and compelling story line and colorful supporting characters. If only they could take the little mermaid out of The Little Mermaid. One last thing: who agrees with me that David totally looks like Prince Eric?